The start of stage 4 in the Overwatch League meant the debut of the newest hero in the game, Brigitte. The anti-dive support was a big question mark, as pros would be playing her on a patch where she was still incredibly dominant. But it turns out, at least in week 1, things were kind of okay. To be clear up front: Brigitte seemed to be on every team’s minds throughout the week, whether they ran her or not. Team compositions would roll out that seemed custom-tailored to that meta, even if Brigitte wasn’t around. A Reinhardt-Zarya tank line could mean a Brigitte was waiting in the wings, and so a team would modify their dive composition in response. Just look at how London reacts to Austin “Muma” Wilmot’s Brigitte in the clip below, to get an idea of how wary teams are of facing the fabled version 1.22 monstrosity. I specify version 1.22 because this stage is being played one patch behind the current state of the game, where not only does Hanzo have a new (effective, in my opinion) ability, but Brigitte has been toned down a little. Her entrance into the game was heralded as the end of dive compositions, but she came out the gate a little too good at everything. It shows in how teams ran her, sometimes subbing out a DPS player to Brigitte instead of a support. The “triple healer” composition fits well with Brigitte’s playstyle, enabling her to stay in the fray and not worry as much about healing. The shield-toting mechanic’s burst damage potential is that high, that she can fill the role of DPS over healer or support. Her strength lies in the bevy of crowd control at her disposal, able to shield-bash and knock away opponents while clubbing them in the face with a giant rocket flail. In a short amount of time, she can reduce a health bar significantly. The potential of a strong Brigitte was seen early on, when Shanghai played Dallas on opening day of stage 4. Ponghop “Mickie” Rattanasangchod took up the flail and shield, and in a clutch moment, slammed Shanghai’s Chon “Ado” Gi-hyeon right as he pulled out his dragonblade. But despite her power, Brigitte was not a silver bullet. Several teams saw middling to little impact from her. The London Spitfire put Park “Profit” Jun-young on her against the Houston Outlaws for a hot minute. It produced few results and Park soon switched back to a regular DPS. Other teams just slotted her into a team comp or even just threatened the idea of a Brigitte, with a lineup like Rein-Zarya, without actually running her. Part of it might be the small amount of time pros have had to practice for this stage. With a short break between stages and especially short notice on what patch this stage would be played on, we could easily see more Brigitte play down the line as teams get comfortable with her. Some already are; Houston, for example, ran Brigitte on both of its DPS players as well as on Wilmot, showing a team-wide versatility with the hero that was fun to watch. There are also ways to beat the Brigitte composition too. “Spam comps,” which incorporate a bevy of raining explosives from a hero like Pharah or Junkrat, can whittle down the defensive line from a safe distance, far from Brigitte’s dash and flail range. Some heroes are especially vulnerable to Brigitte’s burst—low-health DPS like Tracer or Genji are easy pickings if caught out—but others like Hanzo or Pharah can play around her. As analyst and host Soe Gschwind-Penski said during the match between the Gladiators and the San Francisco Shock, most teams see Brigitte as a balanced and welcome addition to the meta. She stills feel a little map dependent, and she isn’t a pick-to-win hero. 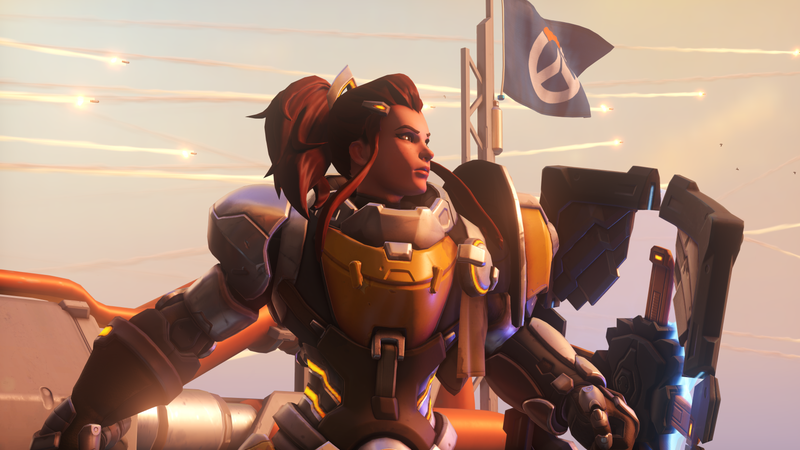 While Brigitte can be incredibly oppressive to certain compositions, especially those that don’t have a solid game plan for dealing with her specific brand of flail-and-board destruction, she hasn’t quite taken over the Overwatch League yet.